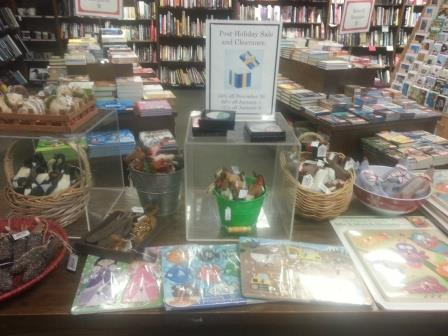 Boswell Kids' Bestsellers of 2014 Part One: Picture Books and Middle-Grade Books. If anything, our kids' bestsellers are even more event driven than our adult ones, though I should note that Sam & Dave Dig a Hole would have made this year-end list even without the event. Left off this list are bulk orders of older titles, but I'll include them if we've had several bulk orders throughout the year. The board book sales tend to build over time, hence a lot of backlist titles. So it's a big deal when new hardcover picture books really makes the list on it's on, without an' event, like Steve Light's Have You Seen my Dragon? Alas, there did not seem to be a picture book driving folks into the store, the way The Day the Crayons Quit last year was, or Goodnight, Goodnight, Construction Site in 2011 and though Dragons Love Tacos has been on the national bestseller lists for close to a year, we simply haven't gotten the traction on that one. The current #1 on the NYT is B.J. Novak's The Book with no Pictures, which is selling ok for us. One of the tricks of kids' events is that sometimes the author only does schools and doesn't have the public event. There are twofold issues. For developing authors, a there's some concern that the author doesn't have enough of a following to get a big enough audience. There are also logistics issues. If you're planning on a different city every day and the author is doing schools in the morning and afternoon, you need the evening for travel. If you exclude events, the bestselling titles turn out to be Diary of a Wimpy Kid: The Long Haul, which was the bestselling book of the year on Bookscan, for adults or kids, Wonder, and The Blood of Heroes. Wonder is the current #1 on the New York Times. Oh, to continue the confusion, I grouped 10 and up books with young adult if that's where we sectioned them, whereas the NYT calls them middle grade. You'll catch that difference on the next list, which I'll post as soon as I can, as I am bringing my laptop in yet again. And one last note, there is probably at least one error in here. I almost lost Animalium somehow in the tabulations, and I have no idea why. I'm going to blame the laptop and the still-hyper-sensitive touchpad. 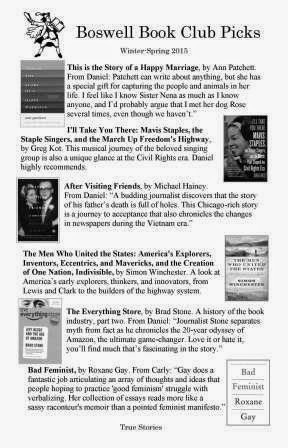 Boswell's Top Nonfiction Bestsellers of 2014! A new hard drive for my laptop left me struggling to find time to get the blog out, and it didn't help that once it was complete, I had a number of problems getting my computer back up to snuff. It's still got some weird quirks, like I can no longer turn off my touchpad. I can't wait for the Milwaukee branch of Milwaukee PC to reopen. It's no longer as close to us as it was on Farwell, but fortunately, the new Jackson Street branch is not too far away. Paul, we miss you! Our last few days confirm--warm, dry weather plus cheap gas led to more folks feeling they had extra money in their pocket and their was nothing stopping them from visiting stores. It will be interesting to see whether our holiday season was better for bricks-and-mortar stores than it looked like it would be going into fall, when a lot of projections were down, and the media was making speculations about the season based on a weak Black Friday. There's nothing to me that indicates more the polarization of the Milwaukee area than our nonfiction bestseller list. Despite the gush of celebrity books, there really only are a couple that made our top 50 (with Dunham and Poehler fighting it out to the end). No, its really events, awards, impulse table, a few gift picks (like Great Maps), and what were probably the biggest books on the ABA (indie) bestseller lists. A big shout out to Kira Henschel at Henschel Haus, who published two of our top five titles, from Khatri and Ellwanger. Our next event with her authors is for The Boys on the Porch, by June Nilssen Eastvold. We're celebrating the release on January 15, 7 pm. Events and regional books and authors are also important to this list, as is the impulse table. And for the category in general (for not just Boswell), boy did films make a difference. A number of publishers put "review copy" stickers on their books they send us and we are respectful of this, but sometimes it pays to leave this off. Workman sent us a few comp copies (with letters) of Think Happy, Be Happy, a book we originally just represented. 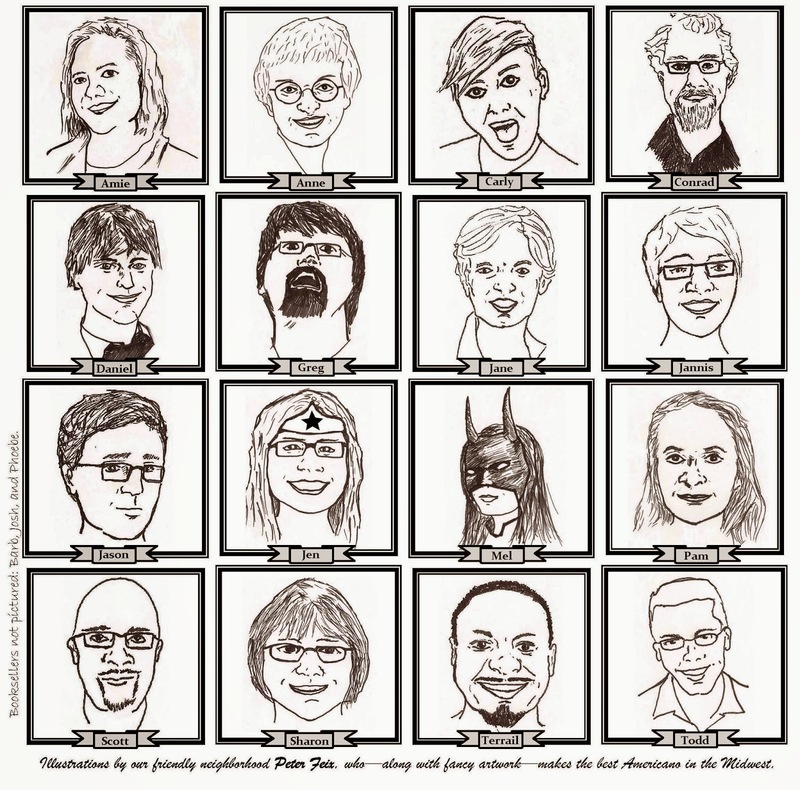 That was enough to get it on our impulse table where it now has sold well over 50 copies. Computer issues are slowing me down! I had a hard drive replaced and it's taken a long time to put my database back together, even though I had a full backup before bringing my laptop in. That said, our year-end bestsellers are itching to be posted, so here they are. Fiction's up first! I was writing a bit about the list and realized it was all a bit mindless. In the end, it's not that striking--only a few indie publishers (you'll see more in the paperback list), generally literary, flirting with genre, not as diverse as I'd like or even as we've seen in past years. I'm not really sure what's up with that. Oh, and we're all taking bets on when we get the news that the paperback publication of All the Light We Cannot See is postponed. It's currently scheduled for June but we see a full year and another Christmas of hardcover sales, particularly if it wins either the Pulitzer Prize or the National Book Critics Circle Award. The main story this year is that there was not a main story year, unlike last year when Beautiful Ruins exploded in paperback. Aside from our ticketed event with Elizabeth Gilbert, our top two books sold about half the level of Jess Walter and the two books that worked at that level nationally (Flynn and Kline) are more like 40% of our Walter sale. While I kept saying that The Illusion of Separateness is a book that, once you start hand-selling it, begins to sell itself as readers tell each other about it, there just didn't seem to be enough indie booksellers out there willing to give it the running start it needed. In that sense, it is 2014's President Hat. I did notice that Costco tried it but I think it didn't have enough momentum, which is why our last shipment of books arrived with a bunch of Costco stickers on them. Similarly, I hoped that Burial Rites would break out in paperback, what with all the great indie reads in hardcover, but that didn't seem to happen. We're the #2 store in the country on Above the Treeline, and while that's great for us (and shows how touring an author can have lasting effects), it's not fabulous for the book in general, And notice the paperback list is a little more diverse, but still isn't that indie heavy. Here's hoping we find a few more Unmentionables in 2015. What's Selling at Boswell for This Week Ending 12/27/14? Runaway Bestellers from Doerr, Kondo and Brown, but Lots to Talk About in All Categories. If you've been under a log, it turns out that Anthony Doerr's novel All the Light We Cannot See is a hit. Alexandra Alter gets the story behind the story in The New York Times. Note: I have to find an image of the cover with all the "medals" on it. I was also thrilled to see Station Eleven get back on The New York Times printed top 15. But I should note that the real winner is Penguin Random House, who has seven of the top 10. Knopf has 3, Riverhead 2, Penguin Press and Little Random House each have one. While PRH doesn't rule this list the way they do fiction, it is bookended by hits from the Crown division. Three hits are from Macmillan, with one title each from FSG (Tobar), Holt (Gawande) and the distributed Bloomsbury (Chast). If you thought the Amazon boycott didn't hurt Hachette, think again. I think they found it particularly hard to break out books this fall--I noticed that aside from You Are Here, which had a strong post-event sale, our biggest hardcovers were from 2013, from Malcolm Gladwell and Donna Tartt. The new Best American Short Stories 2014 may be at the top but unlike many of our other categories (hardcover fiction and nonfiction, paperback nonfiction), it's not a runaway bestseller. In fact, it's trailing 2013 for us. It's sometimes a function of the editor, but I think in this case, the new packaging might have a role. 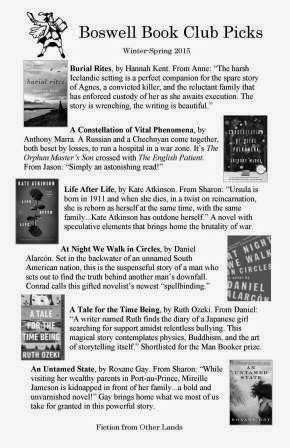 And once again, PRH has 7 of the top 10 bestsellers, but this time Knopf is more in the lead with four. I'm wondering if "The Interview" incident might be helping sales of The Orphan Master's Son. It wasn't too long ago that you didn't know who Jerry Brotton was, but with two books on our bestseller list (Great Maps, our bestselling DK book in a long time, and A History of the World in 12 Maps), you now can't forget this BBC host and professor at Queen Mary University of London. And now here's something unusual--our top 3 matches The New York Times top three for this category on the December 21 list, only not in the same order--Unbroken, The Boys in the Boat, Wild. You just can't top a movie tie-in in the mass market, especially one that outperforms the pundits. Hey Amie, I was talking to a librarian yesterday who said that Nuts to You had Newbery Medal buzz. I guess that's not a stretch, since Perkins has previously won the honor. But this novel about two squirrels who try to save their friend from a hawk is certainly her bestselling hardcover since Boswell has been open and according to my very old records, has substantially outperformed her Newbery winner Criss Cross from 2005 at this store when it was a Schwartz (though probably not the Shorewood location, from which we picked up a lot of the kids' business). And speaking of beating old books, Katherine Rundell's Cartwheeling in Thunderstorms has already surpassed Rooftoppers in hardcover sales and still has some momentum. On the older YA front (our teen section, as they called it when our section was rebranded many years ago), Jandy Nelson's I'll Give You the Sun is well outperforming her previous novel, The Sky is Everywhere, at least with us, but when I looked at Treeline, I can safely say that this is the case in many bookstores. This was one of Phoebe's picks in our holiday newsletter. On the Pabst Farms book (our event is Tuesday! ): "Eastberg's book also serves as a fascinating case study of a brewery that survived prohibition; among other revenue streams, Fred Pabst Jr. and brewery chemist Alfred J. Schedler created Pabst-ett, an aged processed cheese spread often described as similar to Velveeta." 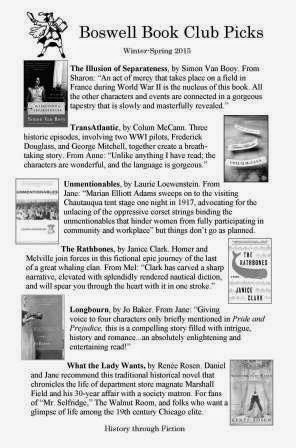 Plus there's a review of the holiday hit, When Books Went to War, by Molly Guptill Manning. It's "the fascinating story of how the military teamed up with New York publishers to bring books to the troops in the field." The review was originally in Newsday and appears in today's Tap section of the print edition. You'd think that this book would resonate with our customer and in fact, we had a very good December with it. It's unusual for a book like this to release December 2; hoping momentum continues into the new year. What I Learned About Our Customers From the Clearance Table. 1. Like many retailers, our December has been back up to two years ago levels after a not-so-great holiday last year. Fortunately that December capped a strong year, so it wasn't really an issue. But as a result, I cut our holiday boxed cards for 2014 and we found ourselves with very left to sell for the last week, and pretty much nothing at clearance (only about a dozen boxes). Next year I'll bring my numbers back up a bit. 2. We don't bring in too much packaged holiday wrap but only one was a complete dud. It was a cartoon nativity scene. What I learned from this was that we have customer who like cute and customer who like religious, but not too many who like both at the same time. 3. Our biggest problem was ornaments was that our original display went out a bit late and in a place where the ornaments were hard to see. There were some duds which I caught as soon as we started receiving (they looked better in the catalog) and some others that surprised me. But in the end, our sales have wound up being about flat with last year. I wish our sell through was better, but Jason reminded me that in this seasonal business, a 75% sell through is a hit, whereas I want everything to sell out 100% before the holiday. I need to remember that when we sell everything through too quickly and completely, we are left with disappointing customers that last week. 4. 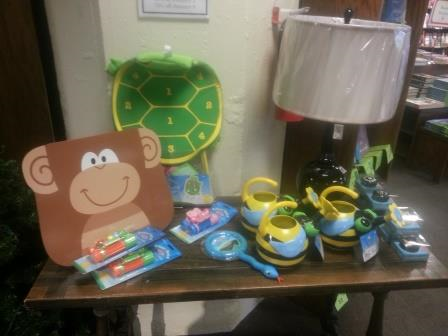 Also on the clearance table, we've got some puzzles with damaged packaging, some summer stuff that didn't work, some things that have been hanging around in the store too long, and a few display leftovers like one bird kite, which otherwise were quite popular. I'm pretty sure there's at least one box of markdowns that we can't find. I'm not sure why, but this happens every year. I think it's probably piled below some old invoices or second-hand books in storage. 5. I thought we were out of the lamp, which is from 2013 at least. But here it is, pulled from its well-hidden box. Well, That's It! We Got Through Our Sixth Shopping Season. December 24th is always a strange day. I feel a sense of exhaustion during the day, but I also feel a kind of sadness at 5 pm, when we close. We were bustling just about all day, until about 10 minutes before closing, when everyone disappeared. The lucky folks who came in to get All the Light We Cannot See and Deep Down Dark, which showed up from one of our wholesalers today, felt they grabbed the brass ring on the merry go round. Thanks to all of you for a great holiday season, and yes, I'm including you, Mother Nature. From all of us, but particularly from Phoebe, Barb, and Josh, who are not pictured, have a great Christmas and we'll see you on Friday. What Was that Book I Heard on the Radio; Some Select Links to Lake Effect and Kathleen Dunn. It's December 23, which can often be our biggest non-event day of the year, and I'm focused on just a few things, like getting several key titles up to one hundred sold for the year, and hand-selling enough titles to get them on our bestseller list. We're out of a number of the hot titles but certainly not everything. The key is that if you're checking stock on our website, don't assume that we have something; it could well be on hold for someone else. There's a good chance we're getting more All the Light We Cannot See tomorrow (yes, December 24) and I don't think they are all accounted for by special orders, so if you have desperately trying to hunt one down, call us (yes, call, don't email)and you can get on the waiting list. Meanwhile, here are some links to book-related pieces that you couldn't remember you heard on public radio. Our FOB Jenny Benjamin reads her poem East Wood. There's not a separate segment pulled out, but Anson Williams also appeared for his book, Singing to a Bulldog: From "Happy Days" to Hollywood Director, and the Unlikely Mentor Who Got Me There. Craig K. Collins offers a memoir through guns in Thunder in the Mountains: A Portrait of American Gun Culture.And over on Lake Effect, Kathleen Dunn talked to Stephen Hargareten about prevention strategies for reducing gun violence. Bret Anthony Johnston talks about his novel, Remember Me Like This. The paperback releases on February 3, 2015 with special Reader's Circle features. And here is a piece on Mike McCabe's Blue Jeans in High Places. Little Creek/Kristin Mitchell is a contract publisher in Madison that generally doesn't index on Ingram, which is the feeder for most independent bookstore websites. Kathleen Dunn talked to Vinh Chung, who wrote, with Tim Downs, his memoir, Where the Wind Leads: A Refugee Family's Miraculous Story of Loss, Rescue, and Redemption. I think this is a reairing. Allen Guelzo is the editor of this Life Magazine project, Lincoln: An Intimate Portrait, also on Kathleen Dunn. We generally don't stock most of these Time/Life books. This reminds me a bit of the British book that used the Smithsonian brand I mentioned earlier this fall. Life Magazine? Yes, I know the book is using their archives, but it's still an odd brand to feature. Oh, and Matt Bai appeared on Dunn's show on December 11 to talk about All the Truth is Out: The Week Politics Went Tabloid, which I've written about on Boswell and Books. I'll have to go back and listen to that one; I also had a lot of questions. Don't forget, we open at 9 am today (12/23) and tomorrow (12/24) and we close early on December 24 (5 pm, not six, alas) and December 31 (5 pm). We're open New Year's Day from 10 am to 5 pm. The Winter 2015 Book Club Brochure is Fabulous Fireball Fuschia. Just what the winter reader needs, a bright collection of book club offerings. I've updated the fall recommendations a bit, winnowing out a few of the titles that had fallen off or were no longer timely, and adding a few new releases. I should note that it's important for me to include six nonfiction titles, which tend to be a bit more out-of-the box than the fiction selections. We also try to offer a spread, including both short and long books, and with a reads that go from relaxing to challenging. One 2014 novel whose paperback dropped in December is The Storied Life of A.J. Fikry, by Gabrielle Zevin, which as you remember, helped us celebrate our five-year anniversary. I am always a little sad when a book like this doesn't get it's hardcover holiday season, but Algonquin got the book into the top 10 of the bestseller list in paperback, so that early release paid off, and we still sold at least one in cloth. I do love the added touch that the hardcover is in the bookstore window of the paperback jacket. One book coming in paperback right after Christmas is Shotgun Lovesongs, by Nickolas Butler, on sale in paperback on 1/27. We've had a nice resurgence of sales in December, and why would we not, being that the book is a Wisconsin-infused story of friendship which had something like six recommendations from current and former Boswellians. 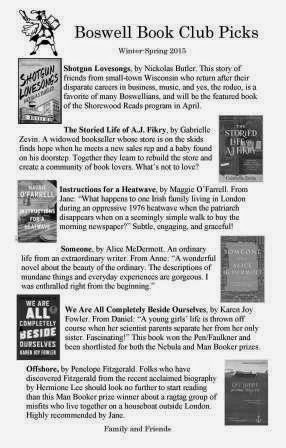 We've already started getting the word out that Butler's book is the Shorewood Reads selection this spring. He'll be at the Shorewood Public Library on April 16. One of the big biographies of fall has been Hermione Lee's Penelope Fitzgerald. I started thinking about just how few major biographies their were this fall, and realized that that is a whole 'nother blog post. What's been so great is that the bio is not only selling, but it's also driving sales of Fitzgerald's novels. Jane's pick to start is Offshore, the Man Booker winning novel about a bunch of folks living on a houseboat. If you do pick this novel, we suggest one of you should read the bio for some background. We're always looking for a good historical novel and Renée Rosen's What the Lady Wants fit the bill for us. The great thing about historicals at book clubs is that you put the book in the context of the times, and what with the popularity of Mr. Selfridge, I continue to hope that this novel finds finds well beyond the Marshall Field's trading area. For groups that want a bit more of a challenge, I think Daniel Alarcón's At Night We Walk in Circles might fit the bill. I still think fondly about the heyday of Latin American writers (remember the Bard series from Avon?) and I'm always looking for writers who are part of the new renaissance. Hey, it ain't gonna come if we don't make it a "thing." His novel is a contemporary suspenseful novel, set in an unnamed South American nation, of a man who sets out to find the truth behind another man's downfall. I'll have more to talk about after our In-Store Lit Group meets to discuss the book on January 5. Our nonfiction selections had the most turnover from the fall brochure. One book that should have been there is This is the Story of a Happy Marriage, by Ann Patchett. Her essays together read like a memoir and have already had some nice pickup from book clubs. Patchett resonates with so many of our customers; even her book picks carry weight around the country. Everyone is out of stock of Deep Down Dark since she picked it for the Morning Edition Book Club and even Barbara Trapido's Brother of the More Famous Jack has become a rediscovery, due to Patchett's help. I think that also deserves a full post. Two other books that have had strong pops this fall make great book club selections. Simon Winchester's The Men Who United the States and Roxane Gay's Bad Feminist might not exactly target the same reader, but wouldn't it be cool if a group read the two in succession? I'm also convinced that Greg Kot's I'll Take You There: Mavis Staples, The Staple Singers, and the March Up Freedom's Highway would make a wonderful discussion. It's a survival story in the context of our history that is also a great read and what a fun evening you'd have if somebody made a playlist. Don't forget, Jane, Anne (and who knows, maybe one of our other Boswellians) will present to your book club at Boswell. Weekday afternoons work best, but some evenings are available, depending on our event programming. We'd hope you'd have at least eight folks attending and that there was a least some idea that you'd be making some purchases, as we don't charge a fee for the service. We've also had some really great feedback about our talks at the Woman's Club and the Shorewood Library, so if you have a larger proposal for us, ask away! Want something a little handier? We've got the fabulous fuschia fliers at the store, along with an insert of some great events for book clubs this winter. Trying to Come up With My Year's Favorites. In Memoriam: P.D. James, Mark Strand, Kent Haruf.